Apart from the Berlinale (from 11 till 21st of february) there are lots of other nice parties and events to attend to this weekend. We have made a selection with some nice suggestions for this weekend. The Sexinvaders (On the Fruit Records/D). Visuals by ICFF vs. Fac. The party starts at 23.30. If you are more into rock and british music then go to the Roter Salon at Volksbühne, Rosa Luxemburg Platz. On Friday there is the British Music Club. Expect music from arctic monkeys, the kooks, hot hot heat, nada surf etc etc. The Volksbühne is just a 10 min. walk from the EastSeven Hostel. Or, if you are lazy :), take the u2 subway to rosa luxemburg platz. The party starts at midnight. Another nice party this friday will be at the WMF Club, That´s what Friends are for. Performances from: Mitte Karaoke DJ-Team, Feed & BassDee, Bleed, Dom, Sachwitz & Wetzel, Plastique De Rêve, Suzi Wong, Peter Bounce, Stoopid, Jama. This party starts at midnight. The club is easy to reach with the u2 (in direction Theodor Heussplatz), get off at Klosterstraße. Ah, on saturday there are more great parties. For instance you could go to the Balkan Beats Party @ Lido (kreuzberg), always good for a great night. Special guest this saturday is DJ Mata Hari (E)… Party strarts at 11pm. If you wanne have some great fun go to Laugh Olympics Improvisation Night at the nearby Comedy Club Kookaburra, a two minute walk away from the hostel, at the Schönhauser allee 184. For Live Music go to the famous rock club White Trash Fast Food. On saturday there is a performance from EAT LIPSTICK, a Glam/Electro/Punk band from Berlin, be there at 10.30pm. This club is also very close to the hostel, a 2 minutes walk, at the schönhauser allee 6. Take it easy on sunday. In the early afternoon you can go for a brunch in one of the many nice cafe´s that surround our hostel. For instance you could go to schwarzsauer @ the Kastanien Allee or entweder oder @ Oderberger straße. A definately must is a visit to the Mauerpark Fleamarket. And if you have time left, go to a museum. For instance to Hamburger Bahnhof, a museum for modern art. Check the Bestiarium exhibition! 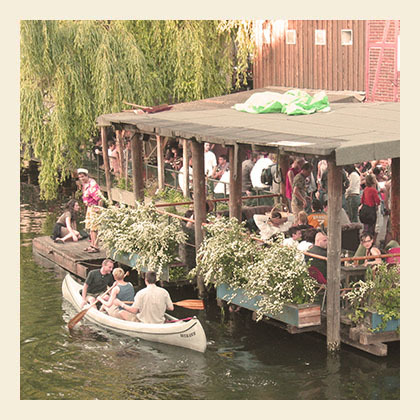 Please check our online staff-recommendations for more nice coming up events/parties in berlin.